Home > News > Manager Selection > Paulson v. Ackman, Bridgewater v. AQR: Who's Trending on Google? A data-driven look into who’s hot, who’s not, and if hedge funds’ online popularity translates into assets under management. Let me let you in a little CIO secret: We can tell when you’re in the running for a new job—or perhaps newly single and tearing up Tinder. How? Traffic analytics. Not to burst your bubble, but when your 2013 Power 100 profile suddenly draws 18 unique viewers in one day, something’s up. But asset managers and public Google traffic data? That’s fair game. For an industry selling the ability to spot the next big thing, hedge funds have a downright geriatric willingness to embrace the internet. The typical American 13-year-old has a more sophisticated online presence than plenty of $1 billion-plus alternatives firms. Hedge funds as a whole tend to shy away from traditional media as much as they do the newer varieties. But ignoring the digital realm doesn’t necessarily mean it ignores you. Online notoriety among hedge funds tracks closely—but not perfectly—with the size of their coffers, according to Google Trends data, the basis for CIO’s analysis. Since 2004, the first year with available figures, the top five most popular funds with Google users have been Bridgewater Associates, DE Shaw & Co., Man Group, AQR Capital Management, and SAC Capital/Point72 Asset Management. This list excludes the large and likely well-searched hedge funds operated by multi-armed financial giants, such as BlackRock, Standard Life Investments, and JP Morgan. Search data for these corporations obscure fund-specific traffic, and thus have been left out. All of the firms listed have been in operation for the full 2004-through-2015 period in question. 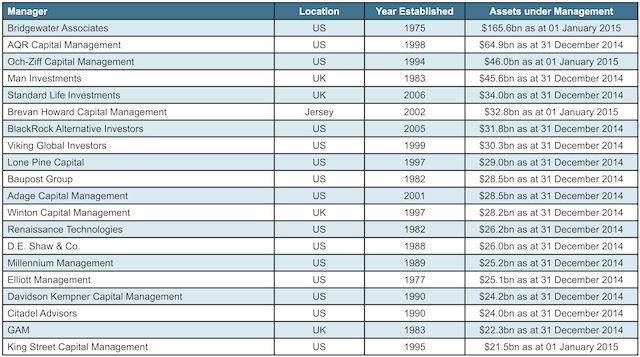 Over the past 11 years, Bridgewater has broadly led the field in both web searches and assets under management (AUM). And as with investor capital, Ray Dalio’s Westport, Connecticut-based behemoth has only increased its traffic dominance over time. But Dalio’s famous name isn’t responsible for making Bridgewater the Justin Bieber of the hedge fund world. In fact, the notoriety of funds’ leading men (and it’s always men) proves a weak indicator of firms’ own popularity. Steve Cohen, John Paulson, and Bill Ackman have all drawn more Google searches than Dalio since 2004, but Paulson & Co. and Pershing Square fail to even rank in the top five of popular funds. If George Soros counts as a hedge fund manager, he provides the most vivid example of this counterintuitive point. Google users have searched for Soros nearly 10 times as often as Cohen or Paulson, and 26 times more than for Dalio. Yet for every query about Soros Fund Management, Google receives roughly six for Bridgewater Associates. If online celebrity translated into asset flows, one imagines hedge fund managers would be stocking Instagram with more saucy selfies than the Kardashians turn out. Yet social media remains nearly bereft of alternatives firms, and plenty of hedge funds have less of an online presence than your neighborhood pub. But judging by Google Trends and investor surveys, that under-the-radar web strategy may be due for a rethink. Over the past few years, the biggest climber on Preqin’s list of mega-funds has been AQR. The firm shot from less than $25 billion and 10th place at the close of 2012 to $65 billion by the end of 2014, making it second only to Bridgewater in worldwide AUM. But before investors deployed all of that capital to Cliff Asness’ Connecticut quant shop, they did some serious Googling. AQR attracted more search traffic in 2012 than Brevan Howard (then the #3 fund by AUM), Och-Ziff (#4), BlueCrest Capital (#5), Baupost (#6), or Winton Capital (#9). Excluding bank-sponsored funds—Standard Life Investments and BlackRock’s—only Bridgewater (#1) and Man Group (#2) out-trafficked AQR in 2012. This digital popularity contest proved a leading indicator of how the world’s largest hedge funds would fare in reality—for the better and the worse. Like with AQR, life has imitated Google for the Jersey, UK-based fund. Its web searches barely registered in 2012 (or indeed any year prior). And, as of Preqin’s latest ranking, neither do its assets on a global scale. The fund suffered a $9 billion capital loss in January with the departure of its computer-driven trading team, but even that dramatic event failed to excite online attention. Recent reports put BlueCrest’s AUM at about $14 billion—a 60% drop in two years. According to several SEO-savvy alternatives experts, there is such a thing as flying too far under the radar, even for this publicity-shy sector. The Google Trends data don’t prove causation between web presence and asset flows, but institutional investors themselves are reporting that the digital domain matters in manager selection. Roughly half of more than 200 surveyed asset owners told Greenwich Associates in April that social media had influenced their perspective on an industry topic or prompted further research into it. A third said their experiences had swayed an investment or provider-mandate decision. Dan Connell, a Greenwich managing director, calls the results “surprising—and not just to me.” But before capital-hungry hedgies rush out and hire the nearest millennial with a Twitter presence, Connell cautions the industry not to get ahead of itself. Just tell that to the founders of Lone Pine Capital (mega-fund newcomer at #9)—if you can dig up an email address.